Pirates との戦闘後のデブリなどでたまに表示される Spaceflies (真空宇宙を飛ぶハエ?) 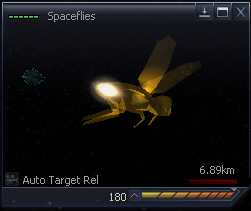 って何だろうと思いながら宇宙を旅していたら突然、Spaceflies が HUD の Target View に表示されるではありませんか!! F3 キーで Spaceflies を拡大表示したもの。このタイミングで Spaceflies の羽根の音（らしい音）がコクピットのスピーカーに入ってきます。いったい Spaceflies って何者なのか?! This creature is a small unintelligent spacefly that lives in the vast emptiness of deep space. They are the size of a small bird and seem to be made out of delicate shining gossamer that reacts to light and shimmers and shines in a multitude of colours. 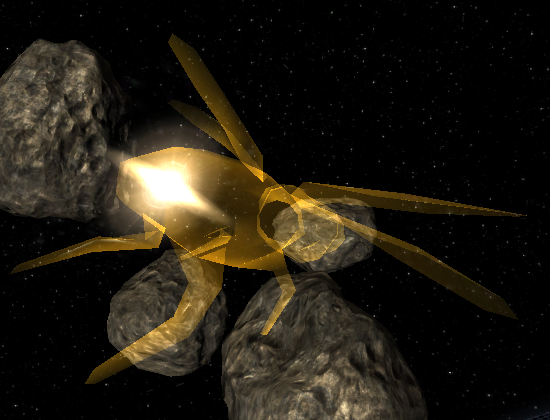 The Markus live in vast complex hives in hollowed out parts of asteroids and perform a valuable function by collecting space junk and other debris, which they capture and take back to their asteroids to be used in the construction of their hives. They travel together in great swarms and communicate with a series of musical notes, similar to bird song, that impossibly echo in space. Their beauty, and the beauty of their music, is famed throughout the X Universe and all intelligent space races delight in seeing them. Pilots will stop to watch a swarm fly past. Creatures working on the outside of ships and space stations have claimed that the Markus will fly near them and even perch on them, singing all the while. 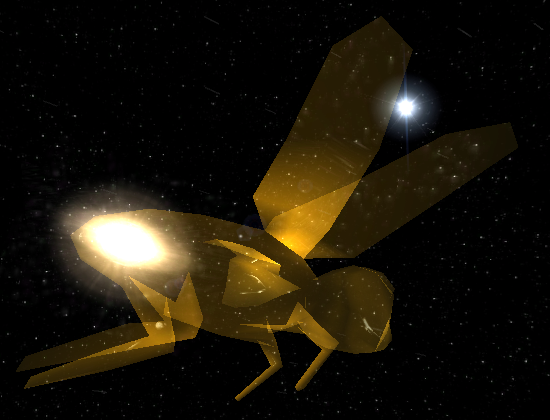 However, throughout space, sightings of The Markus Space Fly are becoming very rare. This is mainly due to the actions of The Split, who capture and use the small space fly to power their spaceships. Currently the Foundation Guild are pressing for the Markus to be made a protected species and pressure is being put on the Split to change their system of powering their spaceship engines. It is believed that, despite a universal ban on their capture or trading, some pirates still hunt and capture this creature in order to sell them to the Split. 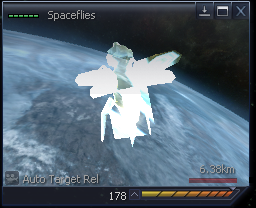 Q: How do I capture Spaceflies? A: You need to purchase a Spacefly Collector from Split Equipment Docks and an Ion Disruptor, found at Boron Equipment Docks. To capture them simply fire the Ion Disruptor and this will stun them, and then allow you to collect them as any normal piece of space freight. You may have to repeat the stunning after collecting a few, as they will wake up after a short while and fly away. Although illegal, Spacefly collecting has become a lucrative endeavour in the universe. These small creatures are stunned by an Ion weapon and then collected by this device for secure storage in the ship's hold. These Spaceflies can then be sold for an easy profit to anyone who will take them. This activity is illegal but within pirate communities it has become a way of life.